Grant us, O Lord, we pray, that the course of our world may be directed by your peaceful rule and that your Church may rejoice, untroubled in her devotion. Through our Lord Jesus Christ, your Son, who lives and reigns with you in the unity of the Holy Spirit, on God, for ever and ever. Jesus told his disciples a parable, Can a blind person guide a blind person? Will not both fall into a pit? No disciple is superior to the teacher; but when fully trained, every disciple will be like his teacher. Why do you notice the splinter in your brother's eye, but do not perceive the wooden beam in your own? How can you say to your brother, 'Brother, let me remove that splinter in your eye,' when you do not even notice the wooden beam in your own eye? You hypocrite! Remove the wooden beam from your eye first; then you will see clearly to remove the splinter in your brother's eye. The feast of St. Katherine DrexeI, which is ordinarily celebrated today, is superseded by the Sunday liturgy. The first reading is taken from the Book of Sirach 27:4-7. The author was a wise and pious Jew who lived about 200 B.C. His purpose in writing was to encourage his fellow Jews to live devout lives following the Law of Moses and the pious traditions handed down to them. He treats of the individual, of the family and of the community, of their relations with one another and with God. In these verses he emphasizes how a man's speech shows up his character and his religious outlook. The second reading is from the first Letter of St. Paul to the Corinthians 15:54-58. St. Paul is speaking of the resurrection of the dead which the death and resurrection of Christ have won for us. In these verses St. Paul ends his discussion on death and resurrection with a hymn of triumph. The Gospel is taken from St. Luke (6:39-45). These statements of Christ spoken centuries ago to his fellow Jews of Palestine are as true and as crystal clear today as they were in the year 29 A.D. They are the words of him who was the Truth. They are put before us today for there are few amongst us who do not need to be reminded of their lesson. We are all so prone to see the neighbor's faults and shortcomings and so inclined to cover up or deny our own. While we ourselves are blind to, or wanting in, many necessary virtues, yet we can spot this lack in our brother Christian and have the audacity to offer to lead him on the right road. We are often lacking in the basic knowledge of the teachings of our faith and yet we can find a thousand faults in the official doctrine of the teaching Church. We can all criticize minor defects in our neighbor's Christian behavior whilst our own Christian way of living is giving far greater scandal. In other words, most if not all of us, are to some degree hypocrites. We pretend to be what we are not, but should be. We pretend to be producing good fruit : figs and grapes, whereas we are only thornbushes and brambles which produce nothing but harmful thorns which sting and poison ourselves and our neighbors. And while I am making these comments I shouldn't be at all surprised if some of my listeners are saying in their hearts: "Mrs. X or John Y is getting it today, I hope they are taking it in," when what we should all be saying is : "How truly our Lord read my heart. How many times in the past week have I criticized my fellow men without knowing all, or any perhaps, of the true facts. How seldom have I honestly examined my own conscience to see my own more serious defects and tried to correct them?" 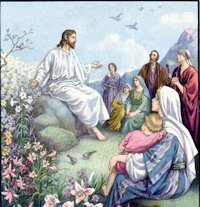 When our Lord spoke these words, his purpose and intention was not to condemn his hearers, the vast majority of whom were guilty of the defects he mentioned, but rather to open their minds and their hearts to their shortcomings so that they would change for the better and learn to live with their neighbor's faults, and do all in their power to correct their own. It is for the very same purpose the Church has selected this particular lesson for us today. We are all guilty of rash judgement and unjustified criticism, to a greater or lesser degree. Let us turn this criticism on ourselves rather, and judge ourselves honestly and sincerely and in a short while we may, with God's grace helping us, notice a change in our Christian conduct. We shall not become saints in a week or a month but little by little, imperceptibly at first perhaps, we shall find ourselves becoming more Christian and therefore more charitable towards our neighbor and less critical of the faults of others. Excerpted from The Sunday Readings by Fr. Kevin O'Sullivan, O.F.M.